I’m a big fan of spy novels and it’s clear, looking at other bloggers’ websites, that spy books are enjoyed by many crime fiction readers. The most fruitful period for the genre is, of course, the Cold War and there have been some excellent books produced by both authors writing contemporaneously with events and current writers who are producing historical fiction. One of the best writers in the latter group is Edward Wilson. I reviewed The Envoy for Crimesquad.com back in 2010 and was struck by the quality of the writing. 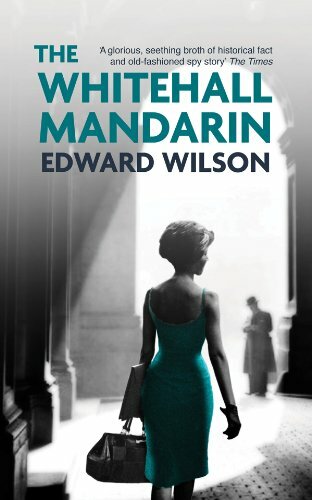 The Whitehall Mandarin continues the story of English spies working to control the ‘red menace’ but shifts its focus to the emergence of China as a strengthening enemy. William Catesby is a British spy keeping an eye on Russian networks operating in the UK. He is beset by internal security problems which range from mutual distrust between British intelligence departments to the ever present suspicion that Soviet spies are operating as moles at the highest levels in MI6. But it soon becomes apparent that Russian intelligence has its own problems and that the secrets that traitors are selling could be ending up in China. The Whitehall Mandarin is a multilayered book with a number of interweaving narratives. It’s a clever idea to look at the tensions between Russia and China in the context of the Cold War and the story foreshadows the emergence of China as a superpower. British upper class society is portrayed as a hotbed of sexual deviancy and this provides the backdrop for much much of the intrigue that takes place. At the heart of the narrative is a secret which I found hard to believe could’ve have been kept hidden for so long but this didn’t in any way spoil my enjoyment of what became a complex story. It’s a shame that, with the exception of The Envoy, I haven’t read any of the other books featuring Catesby as he clearly has an interesting back story. I’ll hopefully catch up with them soon. The cover of my book included a quote calling Wilson ‘The thinking person’s John Le Carre.’ I agree with this although the book reminded me more of Len Deighton’s Spy Hook, Line and Sinker series which I reviewed here. The Whitehall Mandarin captures perfectly the glamour and seediness of late fifties and sixties London society. Thanks to Midas for sending me a copy of the novel which is published by Arcadia Books. Sarah – This is a really interesting way to look at the Cold War dynamics. And the plot sounds tightly knit and well-paced, too. Hmmm..something for me to look up, I think. I’m in a Cold War/spy place now, reading Len Deighton (I’ll be looking up your reviews when I’ve finished!) and I think I’m going to have to add this series to my list, though I will start with an earlier one. Thanks for the tipoff. I know you’ve started on the Len Deighton series, Moira. I’m sure you’ll like these books too. This definitely sounds like my cup of tea Sarah, I enjoy Charles Cummings, Alan Furst, and David Dowling, and of course le Carré, so I’ll be investigating this one – at some point in the future! Sounds like you’re a fan of the genre too. I’m sure you’ll enjoy this. Sarah, I do have Wilson on my radar and some of his earlier books on the pile. There just aren’t enough hours in the day or days in the week to read everything I want to, as soon as I want to unfortunately. Onto the list it goes. Though I should read some of the leCarre’s, Rimington’s Gardner’s, Furst’s and Deighton’s beforehand! God can I identity with the “not enough hours in the day or days in the week” comment! I’m a big Deighton fan, so one for me, definitely — I think I might try to begin at the beginning. Nice to find a new historical spy series to enjoy! Yes, I agree Vicki. And I’m a big Deighton fan too. Definitely sounds like an interesting author. I will be on the lookout for his books. Thanks, Sarah.